Now we have the newest computer animated film, Ratatouille, from Pixar and Disney. It is filled with rats of every shade on the imaginable continuum of rat colors  gray, brown, blue, black. The rats are not cuddly animals a la Bambi or Cinderella. Neither are they life-like, as are the various animals of Happy Feet. They are sort of caricatures. But the star, a young male rat named Remy (Patton Oswalt), has by far the most screen time and an endearing sweetness and determination. Remy wistfully yearns for something more. When he gets separated from the rest of the rat pack in the French countryside, he is lonely and we feel for him. But his unusual passion, to be a chef, and his circumstances, the waterways dumping him in the great culinary city of Paris, lead him to pursue his dream. Considering this is a Disney film, it is not a spoiler to say that we are happy for him and his co-stars at the end. And it turns out that the word ratatouille has several different connotations in the film. 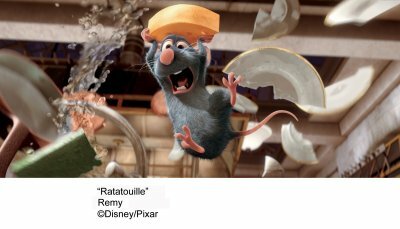 Like the rat characterizations here as well as the people populating most other computer animated feature films, the human characters in Ratatouille are not drawn in an attempt to be life-like. They are caricatures  in more ways than one. I especially like the scary food critic Anton Ego, whose vampirish qualities are so nicely complemented by Peter O’Toole’s voice. Of course, it’s always a fun twist when at least some characters aren’t exactly black-and-white stereotypes and turn out to be unpredictable. That’s the case here. Most of the action takes place in the kitchen of Gusteau’s, a 5-star-turned-3-star Paris restaurant. Its dead founder, Gusteau (Brad Garrett), makes appearances as an apparition conjured by Remy, while its current manager, Skinner (Ian Holm), is the baddie with his over-commercialized sensibilities. But who would have thought a lot of action-adventure could be situated in just one kitchen? And quite the kitchen it is as the setting for the latest in computer animated antics. But perhaps the single most dazzling image, for me, is Linguini’s tiny apartment. Linguini (Lou Romano) is the other star, the young man who pretends to cook while Remy directs him. In his apartment, a wall of glass offers a spectacular view of Paris at night. When the camera pans across the otherwise drab room, it’s a scintillating surprise when the million dollar view is revealed. It beckons to Remy, promising so much if he doesn’t give up and works to make his dream come true. So, will Remy realize his dream? Will Linguini find fortune, fame, and happiness? Will Gusteau’s be restored to its former glory? The movie’s ending does surprise us a little in that the answers to the above questions are not all as you might think. Ratatouille is rated G for all audiences. It opens Friday, June 29, 2007. Search movie showtimes and buy tickets!